By API call ( can be called from some event or action, i.e button click or page load ) of the sort() method. 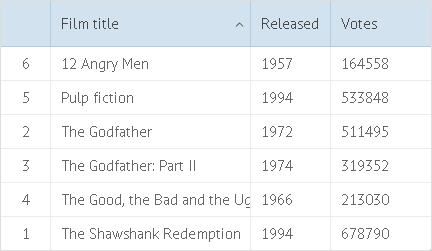 When you click on the header, DataTable starts to display a special control indicating which column the table is currently sorted by and the direction of this sorting (ascending or descending). Each next click on the same header will reverse the sorting direction. Columns can have different type of content (numbers, strings, dates) and each type of content requires its specific way of sorting. To enable sorting and assign the appropriate sorting type to a column, you should specify the sort attribute among the column's parameters and set it to some of the types. The above mentioned sorting modes work with column values defined by their ID attributes and ignore values either defined by column templates or provided by column options. Sorting by visible text is enabled with the help of the "text" sorting mode that switches on string comparison for the values actually displayed in datatable columns. Sorting by dates is enabled by setting the "date" sorting mode. "sort": "date",  "header": "Date Added", "editor": "date"
The detailed information on string-to-date conversion is given in the article Working with Dates. The new data will be loaded to the datatable and replace the initial dataset. If serverFilter is enabled for this column, the data will be both filtered and sorted on the server side before returning to the client. If you want to apply custom sorting behavior, you can define the related logic in a function and set this function as the value of the sort attribute. You should use the sort() method to invoke sorting on some event or action, i.e button click or page load. You can't use this method if you want to sort DataTable by a click on the header. When used with no arguments, the method removes all the sorting signs from the datatable headers. You can define your own sorting type via the sorting.as property of the webix.DataStore.prototype object. where a, b are cell values from the related column.